It's really quite strange that we have never standardized how we communicate the bloom time or height for irises, even though these are required characteristics in registering an iris with AIS. 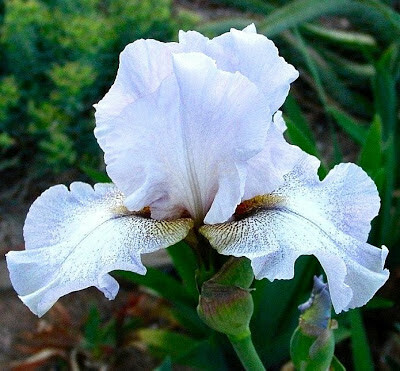 The situation of bloom time as it refers to Siberians is exactly like the bearded irises as described by Jim Hedgecock in his recent post. To me the registration should indicate when this cultivar blooms in relation to other cultivars in the class, hence the E, M or L designations, maybe with a V(ery) added to indicate unusual earliness or lateness. However, clearly some hybridizers use these terms not to indicate peak bloom time but duration of bloom with the designation EML, meaning, I suppose, that it starts early and blooms throughout the season and not that it can start bloom at any time in the season (which is quite unlikely, since relative bloom time is quite reliable with Siberians). The introduction of I. typhifolia to US hybridizers about 20 years ago moved up the bloom season for Siberians since these typically bloom 2-3 weeks before the more familiar sanguinea/sibirica hybrids (although a few sibiricas can bloom quite early too). So the meaning of Early has changed a bit with time. Cultivars with some I. typhifolia genes will likely bloom well before the pack, such as 'China Spring' and 'Who's On First,' or Dave Niswonger’s “China” series. The season used to end for us when derivatives of Bill McGarvey's later whites including heritage from 'Esther C. D. M.' and 'Gull’s Wing' opened up, such as 'Hooked Again' or 'Blushing Violet' . But I believe we may have a new winner for latest to bloom - 'Pool Party'. The last two years this has bloomed for us so late you wondered if it would ever open - after many early cultivars were already bloomed out. However, this may not be typical since 'Pool Party' is registered as an ML bloomer not VL. We don’t grow 'Worth the Wait' (Schafer-Sacks, 2002) or 'Last Act' (McEwen, 1985), but the names suggest that they should be very late bloomers too. Unfortunately, it seems that nothing is ever that simple and there are a significant number of Siberians that repeat bloom (mostly rather sparsely) a few weeks after first bloom. 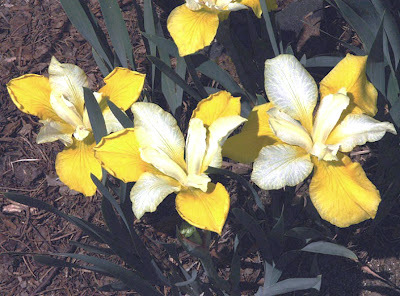 If the repeat bloom period is clearly separated by a flowerless period, it is easy to characterize, but a few irises stagger along between these two seasons and never seem to be entirely out of bloom for several weeks. This characteristic probably this led to the most convoluted registration I know ('White Prelude', McEwen, 1993) which is registered as VE-EML-VL & RE! Whether to indicate the “repeat” bloom in the registration (and advertising) is a matter of judgment for the hybridizer – but if this happens most years and gives a display that attracts attention, it certainly is justified. There is a genetic basis for this tendency. Nevertheless, the nature and environmental conditions that govern "continuous bloom" and "repeat bloom" are still quite mysterious. It also seems that some Siberians repeat bloom more readily in some regions than others, which makes their characterization even more difficult. Height is in some ways a bigger problem, since here we are giving absolute values (e.g. 25 inches) rather than relative ones (dwarf, median etc.) and of course this is going to vary from year to year and from place to place as growing conditions vary. With Siberians a good clump will often have blooms at several heights - shorter around the outside and taller in the middle. This gives a desirable bouquet effect as seen in the photos above. So which height to choose? And then again, the flower stems elongate during the bloom period and may end up several inches taller on the last blooms compared to the first ones. I expect different hybridizers use different methods to handle this variability. I generally record the height of taller stalks (ground to top of flower) for several years before introduction and use the tallest year as the registration height. Why not the average? Because this way seems to me to best represent the genetic potential (under ideal growing conditions) of the variety. What does everyone else do? 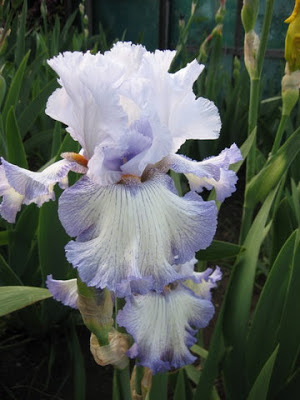 In fact, since there are no size classes for Siberians as there are with bearded irises, exact height is not critical and it would be just as good to have relative classes for height as we do for bloom time. Dwarf, median, and tall are convenient, but that’s not how the current system works, in part because “dwarf” has a specific meaning in the bearded world that does not translate to Siberians. 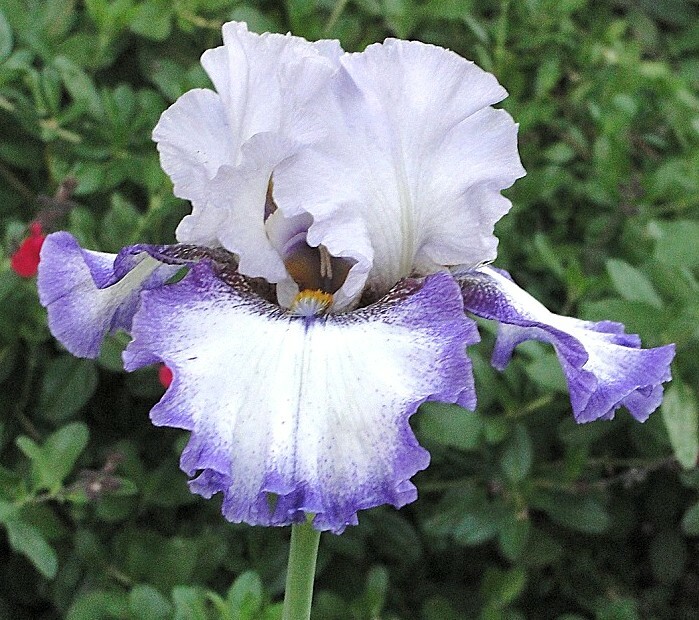 We do have irises that regularly bloom much shorter than most others ranging from the old sibirica nana alba (which is actually a sanguinea in all probability!) to more recent ones like 'My Little Sunshine' that bloom at around 12-15 inches. Compare this to the giants of the Siberian world at 48 inches or taller! Let’s leave with the thought that the long and the short of the Siberian iris world might make a good topic for a future post. 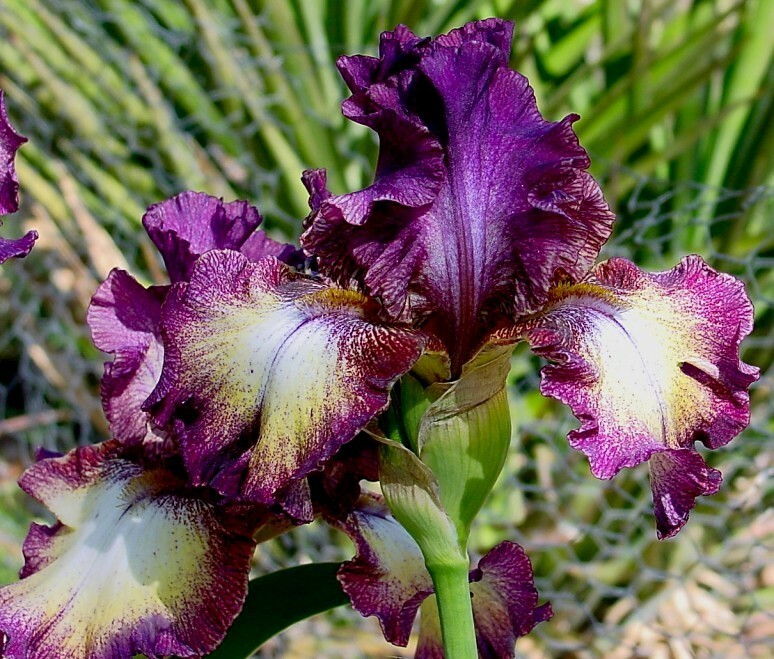 For those of us who do not grow Reticulata iris, this new edition of IRISES, the Bulletin of The American Iris Society, may prove to be the turning point. I hope you will be as impressed as I was with the images and the article by Alan McMurtrie from Ontario, Canada. Mr. McMurtrie was awarded the British Iris Society's Foster Memorial Plaque for his work on Reticulata iris. His third article for our bulletin is Reticulata Iris: The Journey Continues. IRISES is on its way to you right now, and hopefully it won't be long before you enjoy all of the wonderful articles in this great issue. The electronic edition is already available for those who subscribe to e-membership. The issue includes a wonderful introduction by The American Iris Society's new President Jim Morris from Missouri, and IRISES Editor Kelly D. Norris gives a ton of fascinating information about news and information of the Society. 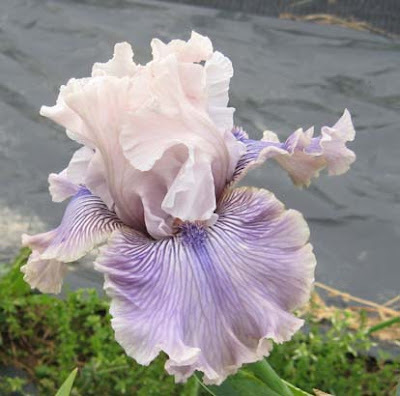 For those new to The American Iris Society, as a member you may choose to receive the printed edition of IRISES, or you can become an e-member and read the entire publication online. The latter is a very convenient option for overseas iris enthusiasts. For more information, please go to our website's membership information section. 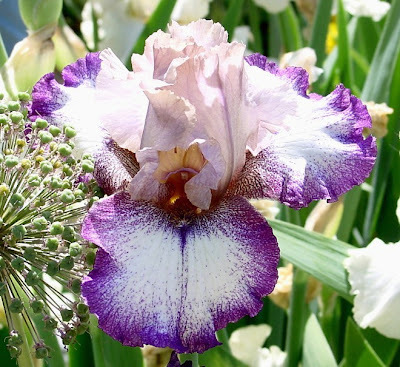 Anyone who googles for irises or visits the popular gardening site Dave's Garden is familiar with Margie Valenzuela's photographs of irises. She has spent countless hours photographing, commenting on, and posting thousands of her exceptional photographs for the benefit of complete strangers all across the Internet. She typifies the democratic promise of this new technology and the selflessness of its best contributors. The American Iris Society World of Irises is proud to welcome her to its team of guest bloggers. Look for her first post in March. 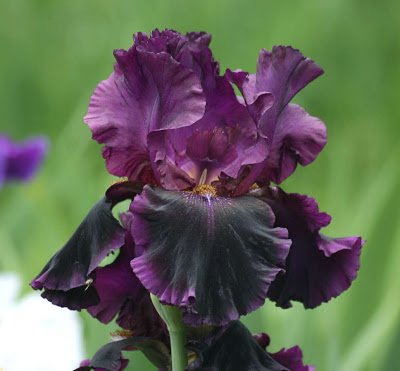 Meanwhile, let's continue our series of posts on avocational hybridizers and their very favorite iris introductions with Margie's work. Although it is hard to believe by looking at her, Margie Valenzuela began growing irises 33 years ago. (At age 10, In the early 1960’s, she won the JFK Physical Fitness Award. It still shows.) After she moved into her first home, she got a lovely surprise: two purple and white flowers bloomed that spring. Then one fateful day she walked into a shopping mall smack-dab into hundreds of irises of every imaginable color. 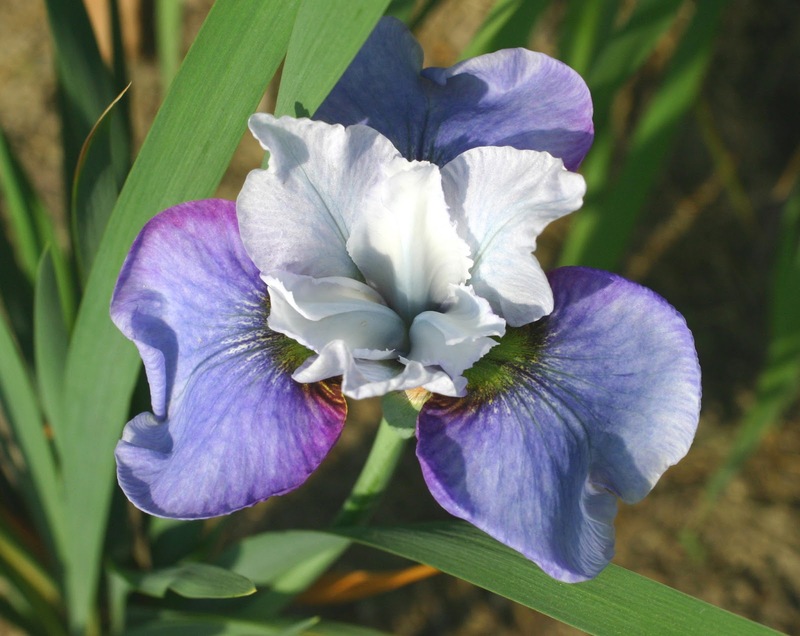 She was smitten by the iris virus, and determined to create new colors and patterns of irises. 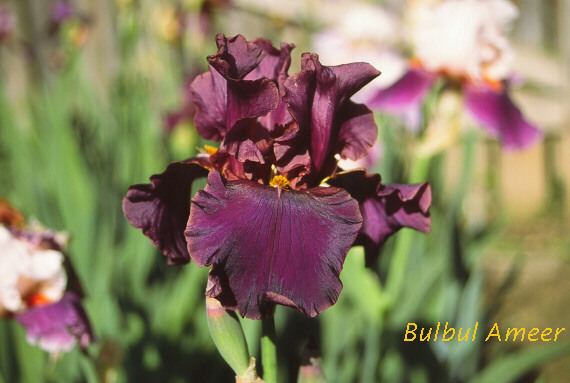 She began dabbing pollen in 1996; saw her first seedlings bloom in 1998; and introduced her first iris in 2007. Growing irises is quite a perilous undertaking even under normal circumstances, but Margie takes it to a new level. She grows the irises in her backyard and the adjoining steep hill, which are infested with rattlesnakes, coyotes, the occasional jaguar or mountain lion, scorpions, javelina (wild pigs), and -if she's out at night- tarantulas. Not to mention the wily wabbits! She lives in Arizona, near the border with Mexico, where the climate is desert-like and dry most of the year, except for a few months of the summer during the monsoons. Over the last few years the monsoons brought high humidity and higher temperatures as well as the afternoon thunderstorms, so Margie faces extreme climates with extreme temperatures: 117 degrees for highs, and as low as 15 degrees without snow for lows. 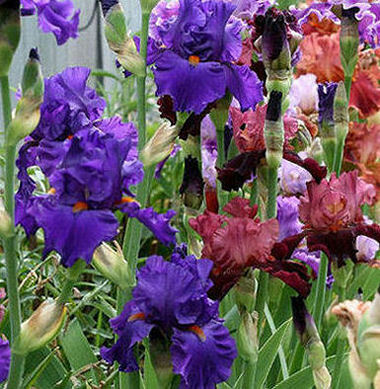 As you might imagine, it's a challenge to keep irises alive at all. Margie has a hard time choosing her favorite iris introductions. Many have outstanding growth, great patterns, interesting and unique qualities, and a few are dependable rebloomers. She was willing to close her eyes and choose a few for the purpose of this article, though, and starts off her list with 'Grand Canyon Gold', which has the 4-4-4 factor of 4 standards, 4 falls, and 4 beards evenly and properly spaced on the top flower of each stalk. Consistently! She notes "there’s never an odd number: that top bud (if it’s displayed) is always in 4’s. A clump of these is quite impressive. I’ve discovered this trait shows up best in the plant if the rhizomes are planted in virgin soil, and/or in soil that is fertilized often. Weather conditions do not seem to matter." Margie cheats a little here- her second choice is her plicatas as a group. She says "the variety of plicatas that one can create is amazing! Every one I’ve introduced is stunning in its own way: all are vigorous, dependable, and have great branching." 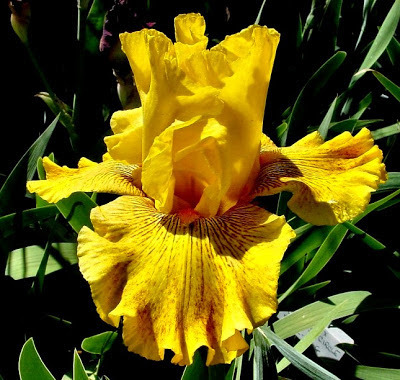 With 'Calizona Gold' Margie honored the recent American Iris Society Convention of the same name. "It’s so bright and bold that it’s a beacon of light in the garden. It also has the 'lines and speckles' pattern in red which enhances the flower. Substance on this flower is so stiff that it keeps its shape without any ‘melting’ in 100 degree heat. Great branching, great vigor, nice ruffles on semi-flaring falls." Margie's final choice is 'My Little Wagon', a near-red with hints of orange. "It has the common form, yet it is so vibrant in the garden, year after year, and so vigorous. It has a way of drawing attention to itself and it knows how to put on a show." Margie says that 2013 is a great year for her: "My introductions were not what I wanted... they were more than I had hoped for!" What does the future hold? Margie enjoys making ‘wide crosses’ (crosses between plants that are not closely related), "though I do plan my crosses with much thought. Too often an unexpected color pattern, or depth of color, or moving color happens by chance. Some ultimately don’t make the cut, and some reselects can’t deal with the excess of desert critters and temperature extremes here to survive to introduction. I look for uniqueness, vigor, form, substance, branching (in most cases), and overall good health of the plant. I do have a few goals, but I keep those to myself, that way if I don’t ever achieve my goals, no one will know but me!" With her angelic personality and deeply held religious beliefs, Margie is quite suitably considering taking up the harp. If she learns to play nearly as well as she hybridizes, there will be a little more heaven on earth. 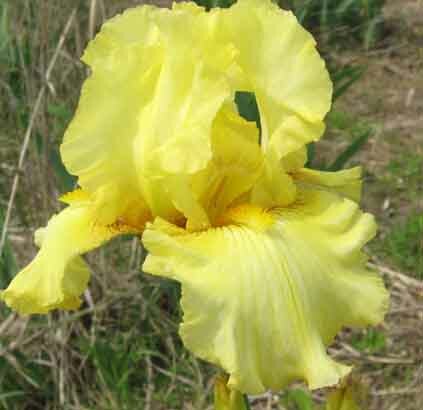 According to the American Iris Society, rebloomers must meet the same criteria that are stated for their individual classes. My breeding program deals with tall bearded iris with the occasional cross in other classes. 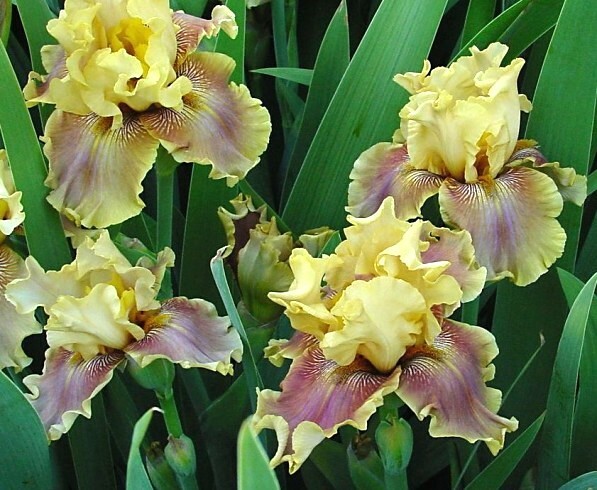 The height qualification for tall bearded irises is 27 1/2" and above. There is no upper limit stated, but an iris must stay in balance. 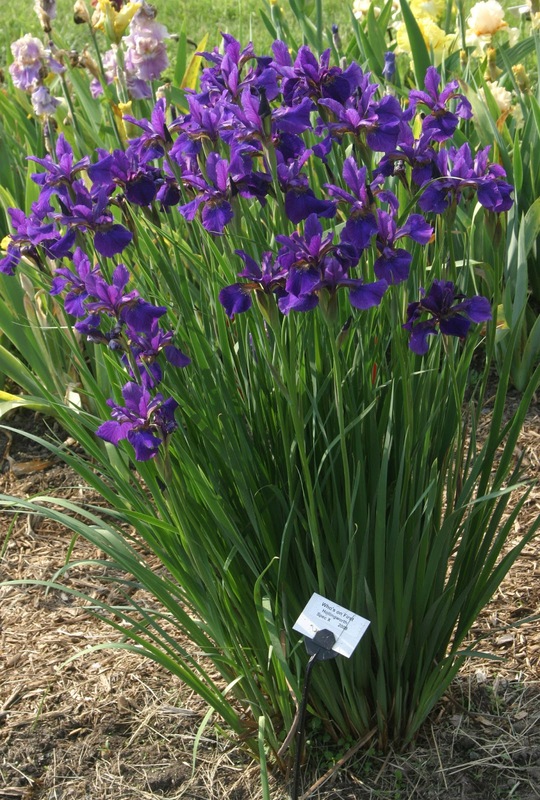 Many tall bearded irises have problems with falling stalks when the height is excessive. As you can see in this clump of 'Summer Radiance' (Wilkerson 96) there are stalks of various heights. The stalks are measured from the ground to the top of the open bloom. This should be done for a two year period. The stated height is the average of these measurements in its home garden. 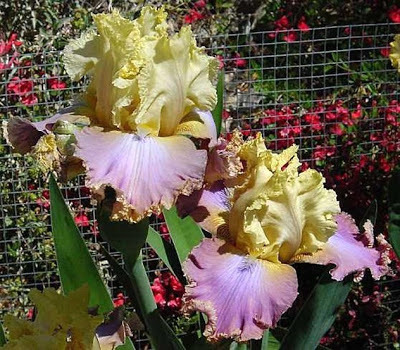 As an introduction moves into the market, there will be some variations in the heights, and the iris may not reach these stated heights in the individual garden. Soil contents, even micro elements, can change everything about an iris, including the height. An early, hot season can create variations in height, too. 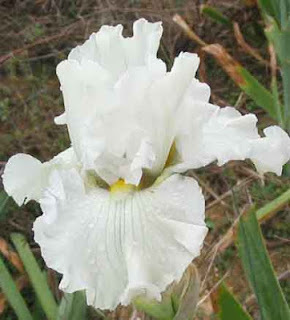 Tall bearded irises are the last of the bearded irises to bloom. Season of bloom is designated within the tall bearded bloom season by VE for very early, E for early, M for medium, L for late and VL for very late. These are determined in the garden of the hybridizer introducing them, and, based on my personal experience, may not be the same in your garden. 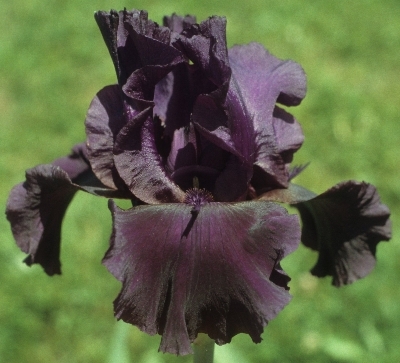 Again, VE means the iris should be one of the first tall bearded irises to bloom in your region and VL means the iris should be among the latest tall bearded irises to bloom. These dates should be taken as suggestions, and may vary from garden to garden. It might seem that all rebloomers are very early (VE) to early (E) in the spring garden since they need time to bloom again, and indeed, most are. 'Star Gate' (Wilkerson 2005) is the only rebloomer I've introduced that isn't an early bloomer. 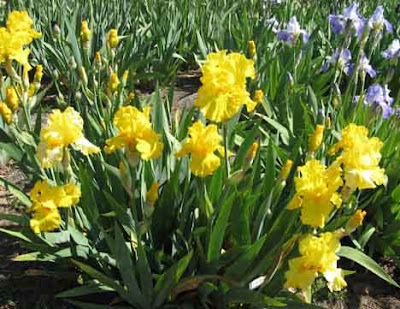 It blooms in mid season and can easily be used in breeding with later blooming spring only irises. As a hybridizer, you plan spring crosses during the winter. The bloom season starts, but new acquisitions don't always bloom as hoped. I rarely order very early irises because they can have a problem during a late freeze, although I occasionally receive very early bonus irises. So far, most of the new irises I've received with the VE classification are bloom EM in my garden. Rebloomers have pushed forward the beginning of spring bloom in my garden. Here, tall bearded season begins with rebloomers and seedlings of mine that contain a lot of rebloom genes. 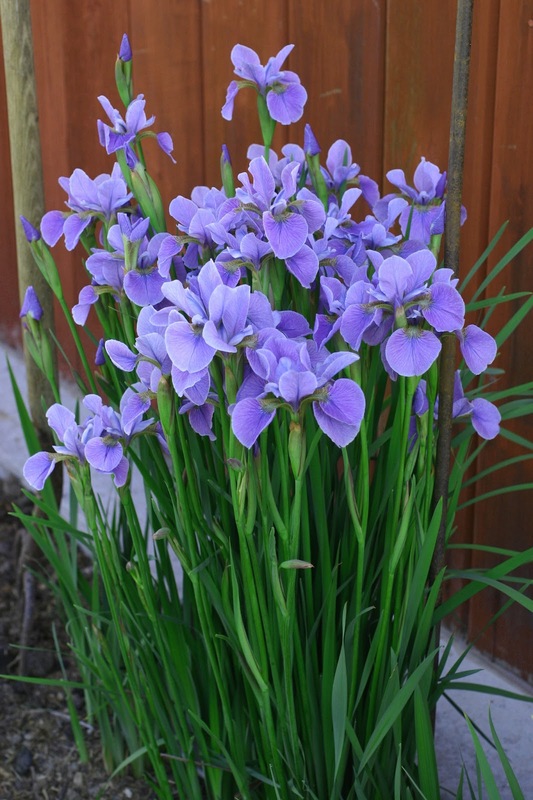 They will bloom for several days before regular spring blooming irises begin. In 2011 we had a light frost at the beginning of bloom season. The blooms and pollen looked fine, but the pollen was damaged on open and nearly open blooms of 'Matrix' (Earl Hall by Lloyd Zurbrigg 1991) 'Echo Location' (Wilkerson 2007) and other open blooms. When the frost hit, there were ten to fifteen stalks with open blooms on 'Lunar Whitewash'. Crosses I made with this pollen did not take. These are the difficulties faced by hybridizers working with early bloomers. It was three or four days before viable pollen was available. 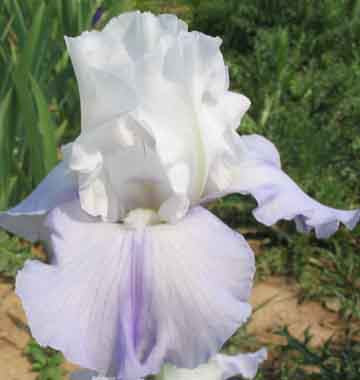 By the time the late blooming irises are open, most of the rebloomers have finished blooming. It’s hard to find anything other than ‘Star Gate’ to combine with late irises like ‘Iconic,’ ‘Haunted Heart,’ ‘Love Lines,’ or ‘Angel Among Us.’ Pollen from rebloomers can be stored in envelopes in the refrigerator for several weeks, but it’s such a busy time it’s often hard to remember to collect it! My favorite rebloomers can bloom any time from the end of spring bloom until a killing frost. To my knowledge, there is no correlation between the spring bloom season and the rebloom dates. Rebloom can happen at any time and is determined by the genes of the cultivar, soil conditions, and weather conditions. There are only a few that can do this in my zone 6 garden during a normal season. A few more can summer bloom in a moderate year, but few produce summer blooms in a hot and dry summer. Cycle rebloomers are not genetically capable of summer rebloom and only rebloom in the fall when the temperatures cool and some fall rain has fallen. 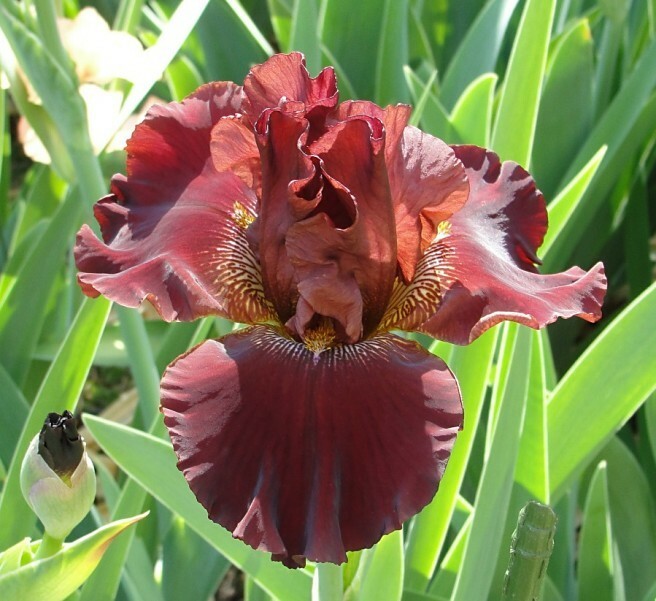 Additional information can be found at the American Iris Society website and the Reblooming Iris Society website. Membership in the latter includes twice yearly publications called 'The Recorder.' This publication reports rebloom from all over the continental U. S. and any other area that reports to them. When do your rebloomers bloom? Have you had summer as well as fall rebloom in your part of the country or the world? When do tall bearded irises bloom? It seems like such a simple question, but in reality, it is complex and you will get different answers from different people. There is the problem of which part of the country you live in, because our seasons differ widely. Today I will tackle a different issue- the designations themselves. What I say here may be discussed (and cussed!) but after consultation with a few other hybridizers, here is, to the best of my knowledge, an answer to the question. 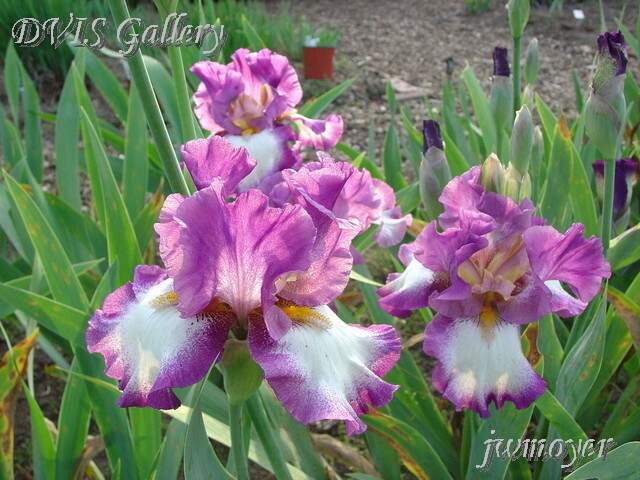 I have been hybridizing and introducing irises for 33 years. 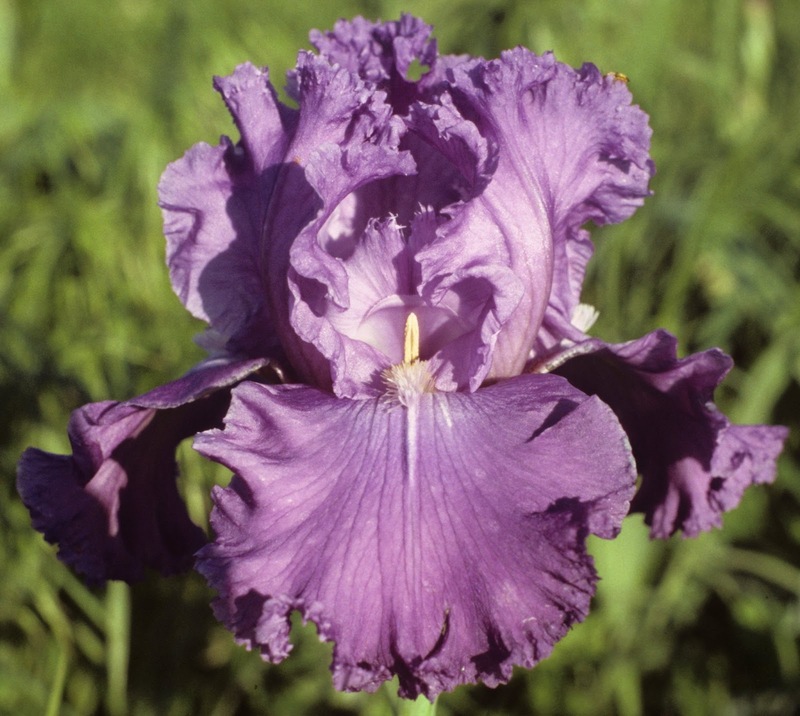 I am a Judge Emeritus with 25 years of iris judging experience. I have never heard of or attended a judges training, course, or session that went into detail about bloom periods or how to designate a given period of bloom to a new iris, but some things we can probably agree on. 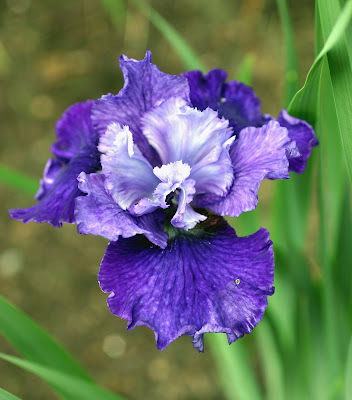 We can all agree that there are three basic bloom period designations for all irises. These are early, mid, and late. They are listed in the registrations as E, M, and L. If this was it, there would be no need for this article. It's what we add to those three designations that causes confusion. My 2013 introduction, 'La Di Da', is a late season bloomer. 'Paul Black' is another late season bloomer. 'Cowboy in Black' is a mid-season bloomer, as is 'Paris Fashion'. 'Acoma' is an early bloomer, as is another of my 2013 introductions, 'Star Voyager'. 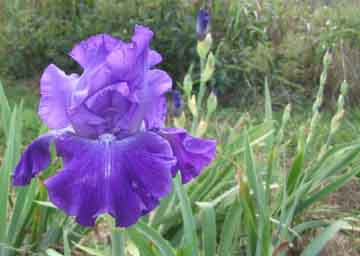 If an iris blooms before any other iris, or after all of the other irises, sometimes the letter "V" is added. That gives you very early (VE) and very late (VL). That's still pretty basic stuff. Griff Crump's 'Bulbul Ameer' is a very late blooming iris. Stay with me, it gets better or worse, depending on how you look at it. A number of iris registrations list bloom times of EM or ML. Now things are getting a little more confusing, but here comes my take on this group. The second letter is still the basic time of bloom, so EM is in the mid bloom season, but a little earlier than most. 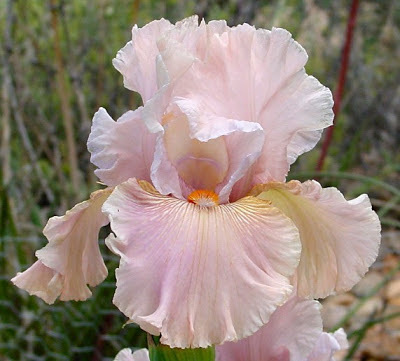 However, in researching this group with other growers, I found out that some hybridizers use these designations (EM or ML) to tell the public that the iris blooms in both the mid and late bloom seasons. 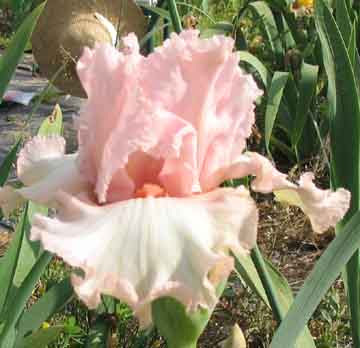 For instance, Schreiner's Iris Gardens uses the designation EML for an iris that opens blooms throughout the entire season. I will be honest, I have never registered an iris this way, and I had never thought of doing it in this manner. My 'Kansas City Star' blooms early in the midseason. 'Pansy Parade' is registered as mid-late, and it blooms in the late part of the mid-season, according to Walter Moores. 'Saturday Night Live' is registered as EML, because it blooms throughout the entire season, according to Schreiner's. 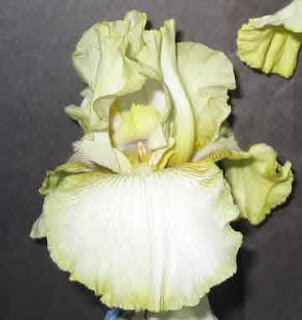 To conclude the discussion, some hybridizers use the V, E, M, and L bloom time designations in combination to show an extended bloom time, and others to narrow down the exact time of bloom. 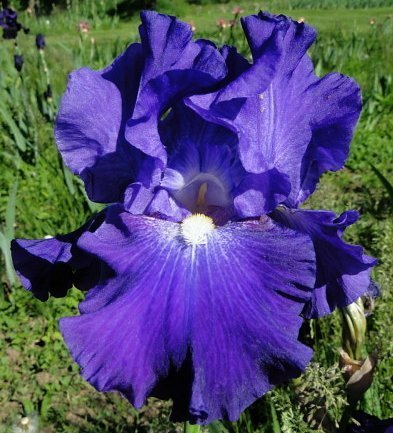 What fun it would be to order a number of irises with the same listed bloom time and grow them yourself to see which is which. In your experience, do irises with designations of EM, ML, or EML bloom for longer periods of time? Please leave a comment in the box below so that others can have the advantage of your experience. Part II will address bloom height, so stay tuned.